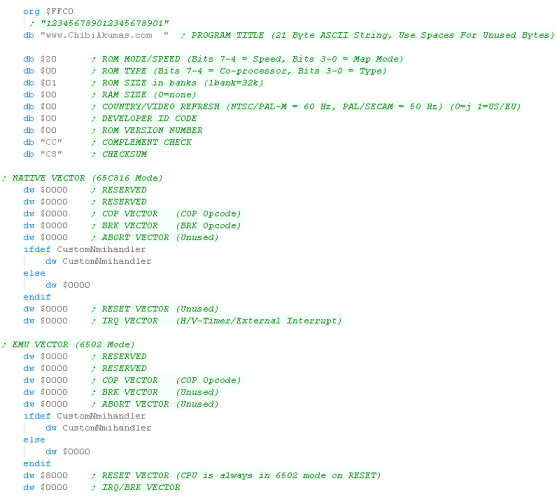 Learn Multi platform 6502 Assembly Programming... For Monsters! 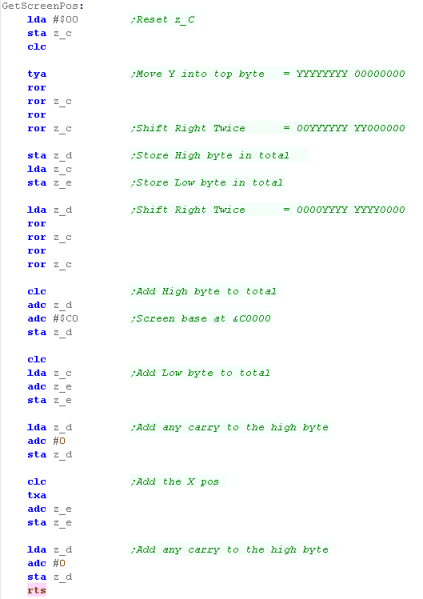 You should know 6502 already, If you don't please go through the Basic 6502 Assembly Lessons first! Each lesson will have a matching Video tutorial, and if you just want the code, you can skip knowing how it works, and just download the code! Enough talk, let's start creating code, and put those 6502 machines to work! 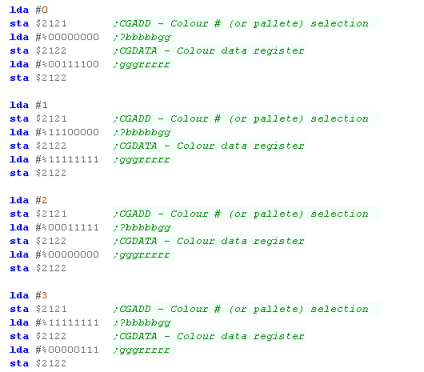 Screen data is memory mapped... but on the BBC it's in a slightly odd format... lets take a look! This will continue untill the far right of the screen... then the next byte will be the far left of the next 8 pixel tall strip. We may cover other screen modes later - but for now we're just going to cover this one! 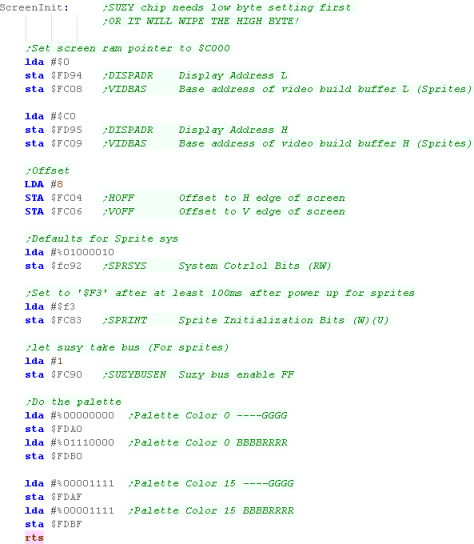 The way we set up the colors is rather odd, we need to define 16 definitions that map bit layouts to colors - in 4 color mode this means we have to set 4 settings to the same color to have the screen work as we'd expect!... we'll see this later! IThis tutuorial uses Mode 1 (320x256 @ 4 color)... however depending on your requirements you may prefer to use Mode 5 (160x256 @ 4 color) or Mode 4 (320x256 @ 2 color)... it will just depend on your graphical requirements and how much memory you can spare! Lets set up the screen! We should set all 4 of the C nibbles to the same color for a 'normal screen... if we do not - opposite columns will have different colors, or pixels with different colored neighbors will be strange - try different settings to see what happens! This will set up the Screen position. 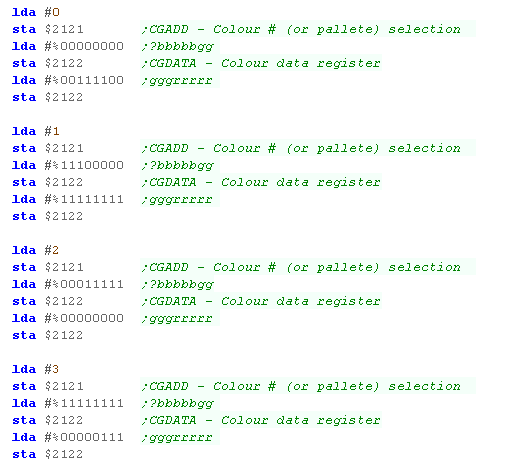 Finally, we need to set up the colors, we do this by sending 16 bytes to $FE21 to define the color layout onscreen. It doesn't look like the Horizontal and Vertocal sync registers have any effect on BeebEM ... it seems like maybe these aren't supported by the emulator? The values here should work, but the author of these tutorials doesn't own a BBC so it's not been tested on real hardware!... feel free to donate one if you're not happy with that! We're going to draw our Chibiko character to the screen! 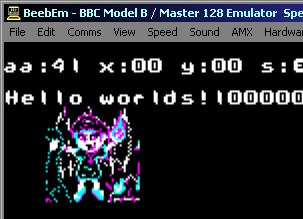 - we can convert a bitmap into the correct format for the BBC screen. 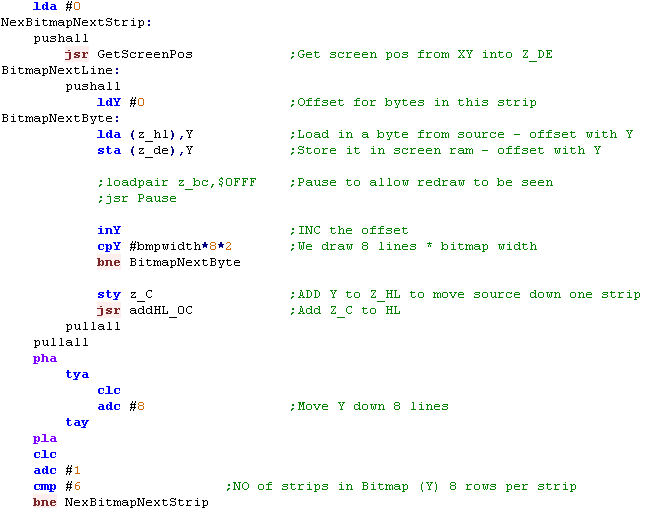 We can then write out bytes to that address to draw our bitmap! Really this is just here for compatibility with other systems! 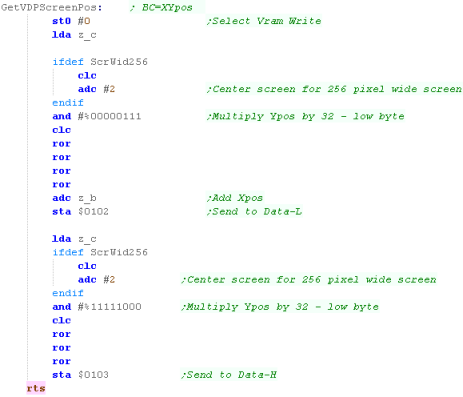 Note: Because the BBC works in 8 pixel tall strips, the GetScreenPos function ignores the bottom 3 bits of the Y line - if you need that functionality, you can add it to the function - of course, this would make the function slightly slower, but if it's what you need, then go for it! 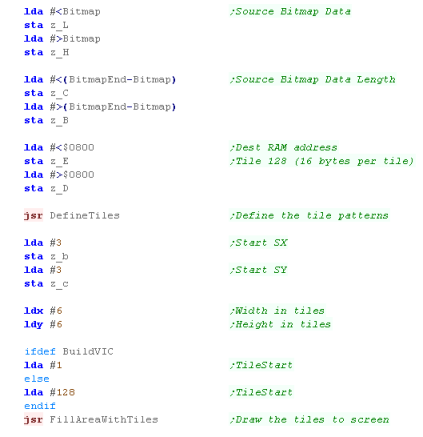 We now reapeat the procedure until the bitmap is drawn! Warning! This routine uses Y as a counter for bytes within the current strip... that means this function will only work for a bitmap upto 32 bytes (128 pixels) wide... if you need more - you're going to have to do the work yourself! What? you want it ALL doing for you? - yeah good luck with that! Unfortunately, setting it up is hard - we need to define a 'Display list' which configures the screen layout, and the A5200 and A800 have graphics hardware at different memory locations!... Lets learn how to make it behave! 4. The list must end with $41 $BB $AA... where $AABB is a pointer to the start of the list. Here's the display list we'll be using! This template will work for screen modes E or F - but if you want to use different modes, or you want to change mode midscreen, you'll want to write a new one... just make sure you follow the rules, and you should be OK! In 2 color mode only the BRIGHTNESS of the 2nd color is used - they'll both be the same color as the background! there also seems to be an inconsistency in the way Atari800win and Jum52 work with 2 color mode - but this may be a bug in the emulator! We’ve effectively multiplied Y by 40! 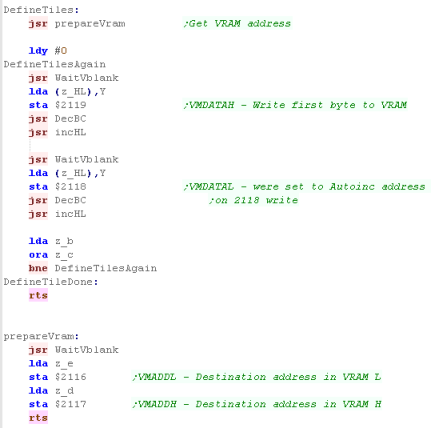 Using a loop with Y and repeatedly calling GetNextLine would work and be simpler, but it would be much slower! We're going to use z_hl to point to the source bitmap. we'll repeat the procedure until we've don all the lines. Lets try and figure it out! 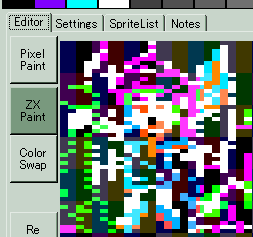 AkuSprite Editor halves horizontal resolution when exporting 4 colors... but If you're super smart ,you could have both the colors, and better resolution, by cleverly laying out the pixels! 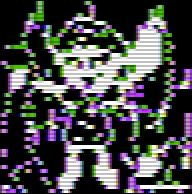 Pixels in Each line are in normal Left->Right format, however remeber 7 pixels are defined by each byte, with 1 bit defining the color palette. On the Apple II the graphics screen can start at $2000 or $4000 ... we'll put it at $4000 so it's out the way of our program code! Just accessing the ports has the effect of setting up the hardware! 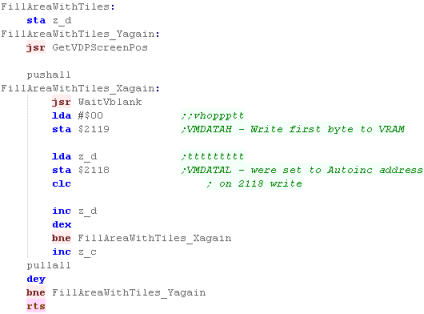 we're using LDA here, but STA will work too, and any value can be written, and the effect will be the same... weird eh? Within an 8 line 'block'... We can move down a line by just adding $0400... but we'll have to recalculate the X,Y co-ordinate after that. 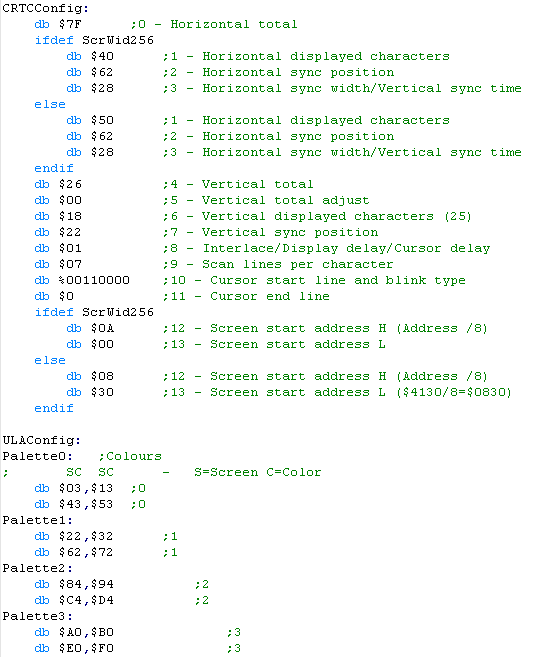 Unlike most of our systems The Lynx has a 16 color Bitmap screen - effectively we can just write data to it - one nibble per color to ram, and it will appear on screen! We do need to do a bit of setup first to get it working! 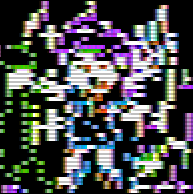 The Lynx's hardware sprite processor (Suzy) reads compressed sprite data from normal CPU ram, and renders the sprite data back into normal CPU ram!... 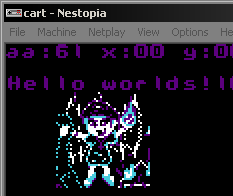 the sprite CPU is EXTREMELY fast - so this is pretty much instant - and means the Lynx is capable of quickly drawing a HUGE number of hardware sprites! 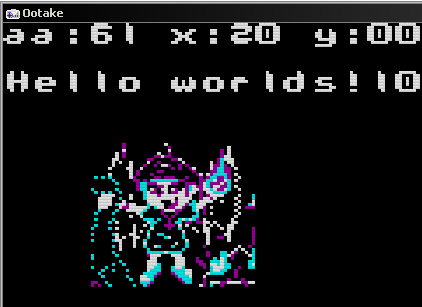 We're not going to use sprites today, but it's important to understand that the Lynx screen is 100% bitmap based! and before any sprites are drawn. Finally we'll set up some default colors so we can see our screen and text. 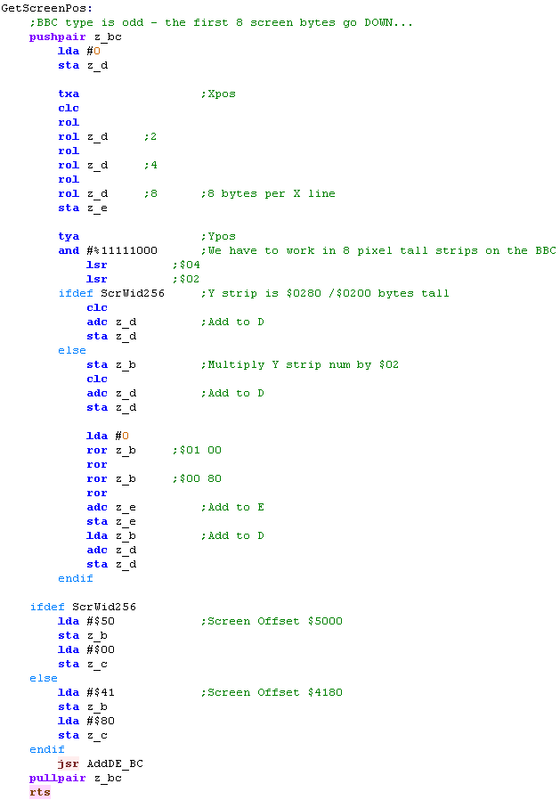 We're loading the screen-buffer at $C000 - near the top of the memory map - but you can load it anywhere you want - also remember, despite the confusion of hardware sprites, we can treat the Lynx screen as a simple bitmap... Grime 6502 did this - it never used hardware sprites - and in fact, for a 6502 the Lynx is very fast anyway - so you may never need hardware sprites! We’ve effectively multiplied Y by 80! 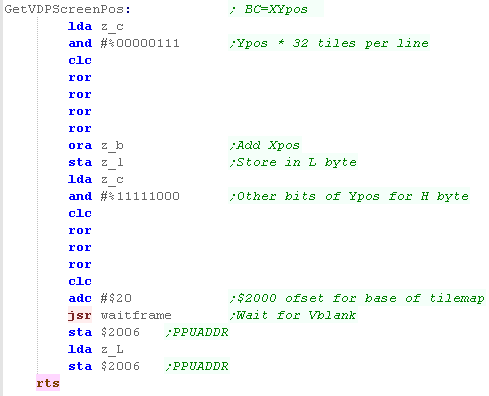 This function takes an Xpos in bytes and, Ypos in lines in the XY registers. Of course if you like the tile based way of doing things, the SNES or PC-Engine may suit you better... Though technically they aren't 6502 based. 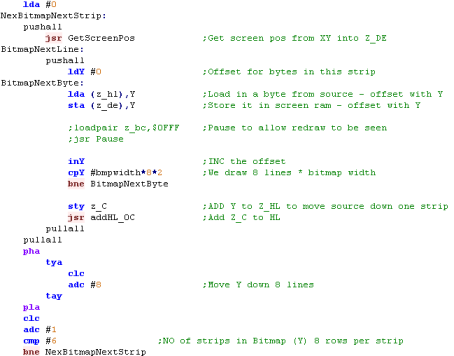 We ALWAYS write data to the graphics system registers in HL byte pairs... Little Endian, so low byte first. 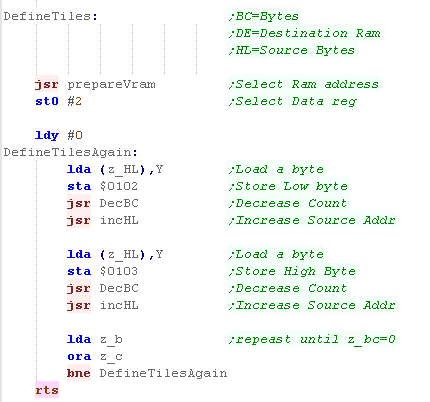 The effect is, that there are 2 bytes at VRAM $0000... and two bytes at VRAM $0001 ... and these bytes DO NOT OVERLAP! The ports repeat every 4 bytes, so this has the same effect, and gets around the limitation of the assembler. Next we need to define our tilemap with Reg 9... we're going to define a 32x32 tilemap for our background. 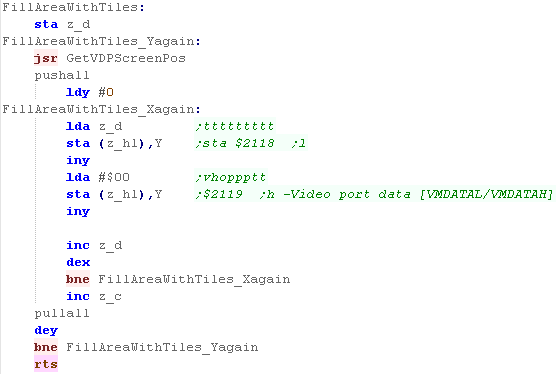 We need to initialize the position of the tilemap with registers 7 & 8... for some reason 0,0 will not be the top corner unless we set the Ypos to 248! Last we'll set the background color to blue by setting entry 0 in the VCE to a blue color... By default all the colors are white, and we wouldn't be able to see anything! 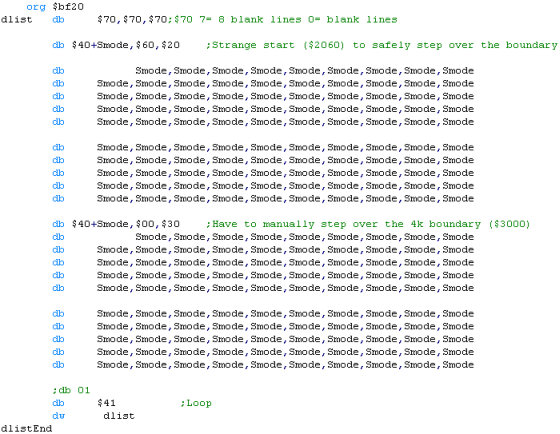 It just depends what you're doing, Grime 6502 has no scrolling, so this layout was fine! 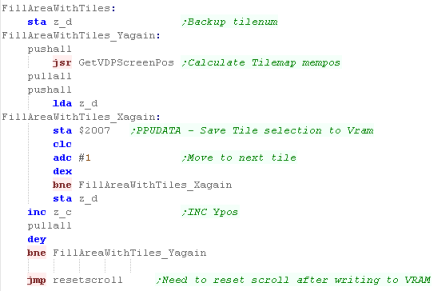 We do this by multiplying our Ypos by 32 (the width of each line in tiles) and adding the Xpos. Remember, We're using $0102 and $0103 to write data - you may see elsewhere $0002 an $0003 used for the same purpose, but this confuses VASM - as it mistakes them for the zero page... 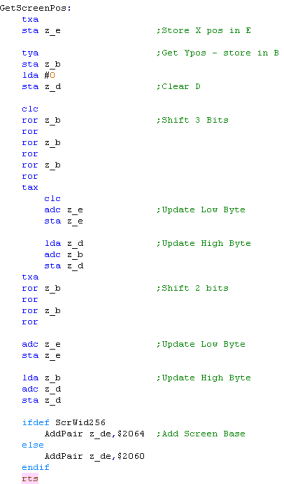 But whatever you use the result is the same, as the ports repeat every four bytes! 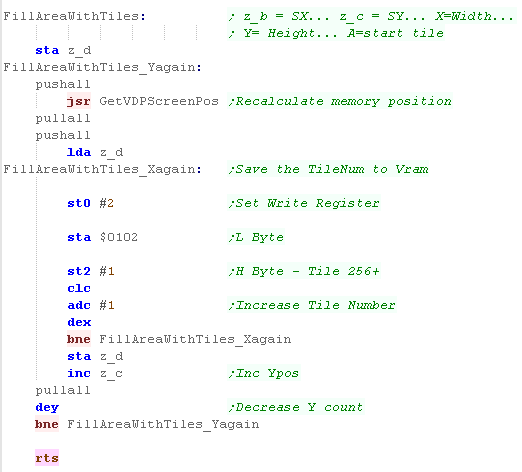 Our DefineTiles function will use the PrepareVram function to get the memory ready to receive data. We loop until we get to the end of the line, then we repeat - recalculating our VDPScreenPos until we've done all the lines. By the end of this procedure, our character will be drawn to the screen! We can do the same to make a simple game, see Grime 6502... if you want to do better graphics, you want to use sprites, we'll look at those later! If you use AkuSprite Editor (included in the Sources.7z) you won't need to worry about the data format of the tiles - as it's a little odd! But if you do, then you'll need to know about the format, shown below! The NES and Famicom use a graphics system called the PPU - they are also Tile / Sprite based systems, with a grid of 8x8 tiles in the background. As with the PCE, we'll use these to draw our Chibiko character bitmap to the screen as a set of tiles. 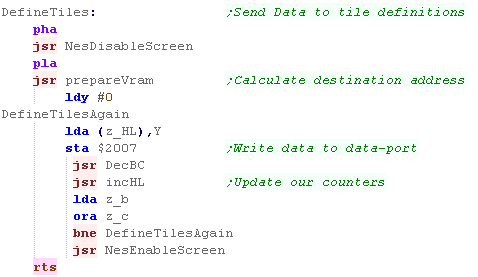 The NES has dedicated VRAM which contains tile patterns and the Tilemap... We'll need the patterns for our font and the bitmap definitions, and set these in the TileMap to see them onscreen. 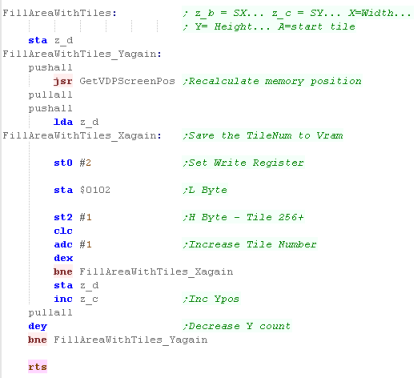 By default the NES has just 2k of VRAM, and tile definitions are in ROM, but we'll use 'Memory Mapper 4' - a cartridge based upgrade - this increases VRAM up to 8k, and allows us to define patterns in RAM like on other systems! 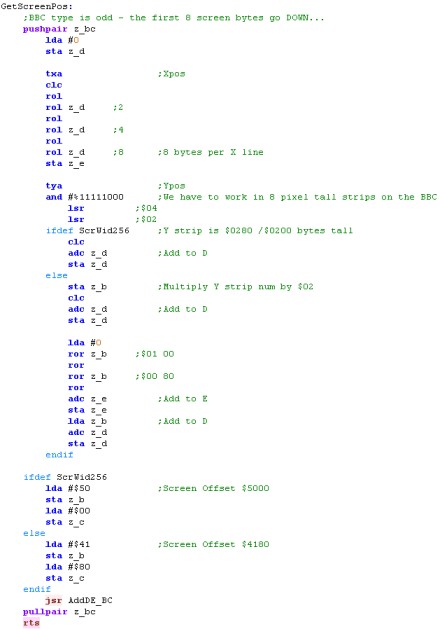 Strangely, when we want to write to VRAM, it's in Big Endian mode - so we have to send the High byte, then the Low byte... the opposite of the normal 6502! EG, lets point to $3F00... and write $11 to the first palette entry! 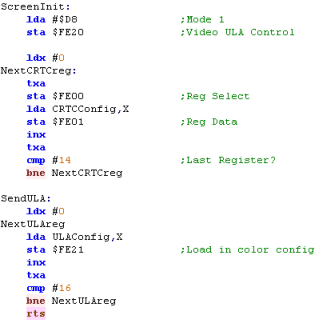 Basic NES roms have pattern definitions in ROM (CHR-ROM), but we can use a mapper with extra video ram to make things easier - in these tutorials we'll use Mapper 2 - so we don't have to worry about CHR-ROM and can change the patterns whenever we like! First we send all 8 lines of the first bitplane, Next we send all 8 lines of the second bitplane. You shouldn't need to worry about the tile format if you use AkuSprite Editor - the open source sprite editor supplied with these tutorials will do the work for you. 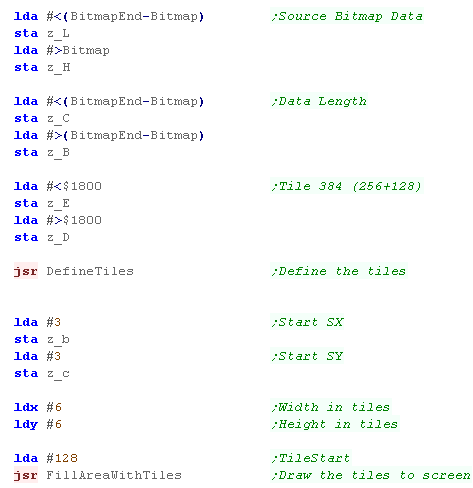 The NES 'Save Raw bitmap' option was used to convert the sample bitmap into a grid of tiles in the correct format for the NES! The NES graphics system has an annoying limitation! 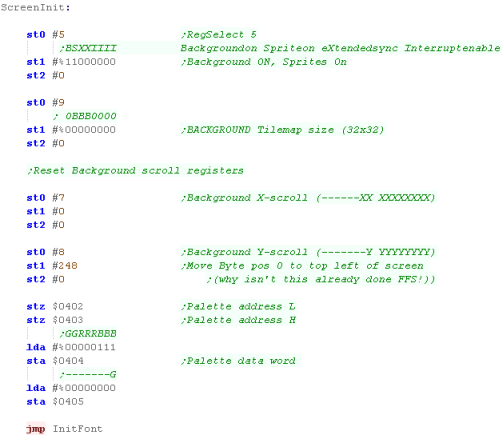 As writing to the PPU will mess up the scroll position, we'll define a function to reset it. 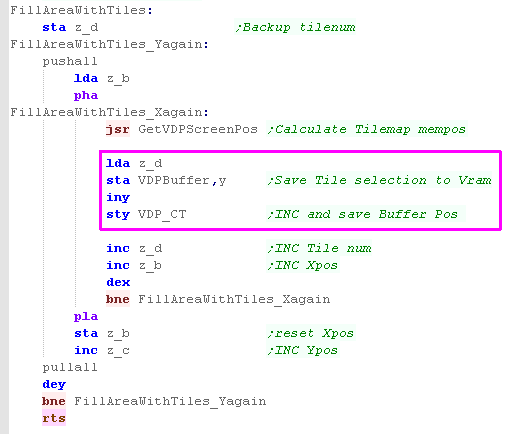 We can't write to VRAM outside of VBLANK (The time the screen is not being drawn)... because of this we're going to need a function to wait for VBLANK to restart. We'll see an interrupt handler later in the lesson! Every time we write to the screen, we need first wait for VBLANK (when the screen isn't being drawn) and also reset our scroll after we're done. This is a real pain, but we'll learn a trick to work around it! We're going to show our Chibiko character to the screen! After all the data is sent, we turn the screen back on! 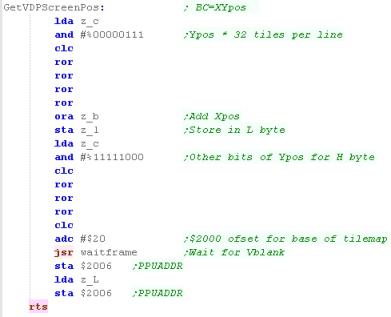 The Prepare VRAM command is also very simple, to select the memory address in zero page entries z_de, we just write the high byte z_d to address $2006 (PPU ADDR), then the low byte z_e to the same address.. This sets the address the data will be written! 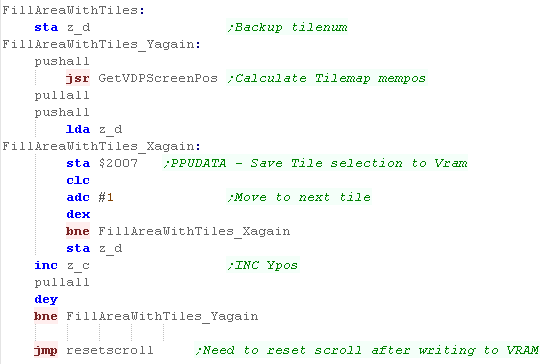 As we saw before, FillAreaWithTiles will set the visible tiles to a range of defined patterns. 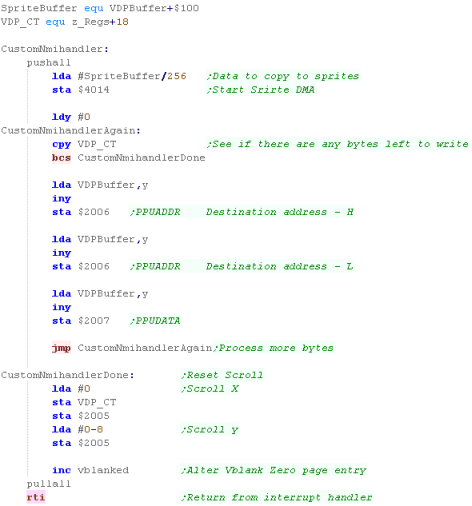 Writing to VRAM messses up the scroll position - so we reset it once we're done... there is a way to avoid this, which we'll learn in a moment! We do the multiplication by bit-shifting. Then we send it the PPUADDR.... high byte then low byte! The result will be no waiting around, and no visual corruption caused by the scroll changing! Using a buffer to stop the scroll problem! Here's our Interrupt handler that will run during VBLANK. 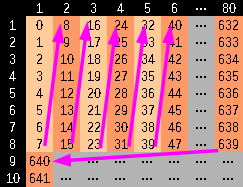 First we're starting the Sprite DMA with $4014... don't worry about this - it's for a later lesson! 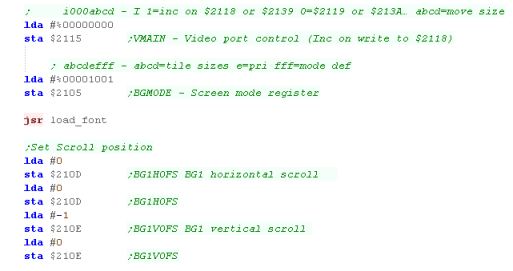 As we've written to VRAM, we need to reset the scroll position as before. 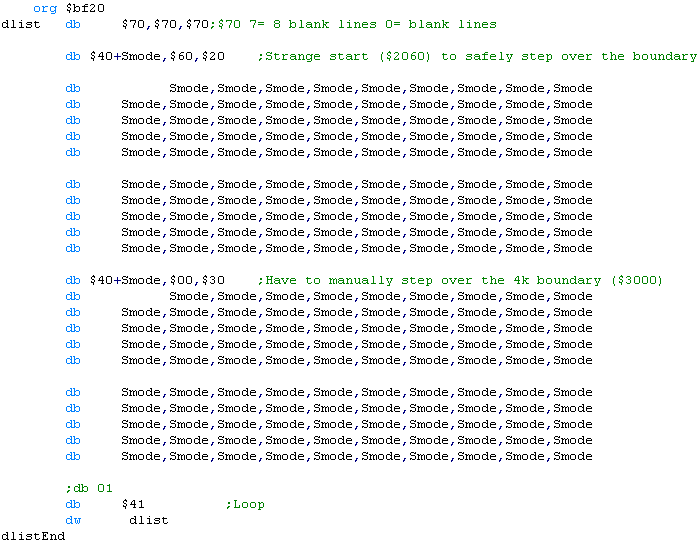 This buffer code works, but it's pretty basic and crappy! 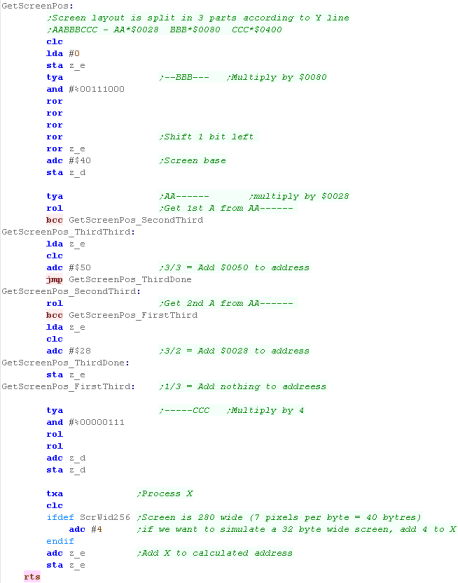 This code also wastes a lot of buffer bytes - as each written byte has an address pair... if all the bytes are consecutive, this is very wasteful! We need a bit of set up to get the screen working, but once it's done, things are pretty easy. wd $2104 OAMDATA OAM data ???????? ???????? we're also setting the tilemap size - we're using a 32x32 tilemap in these examples. We need to turn on the layer (we're using layer 1), we'll also set the screen brightness! Finally our screen is set up! 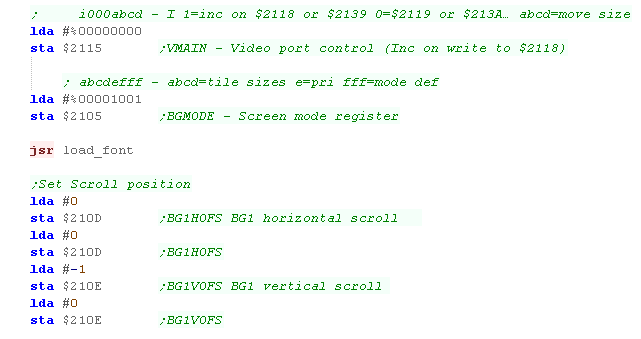 We can detect this by tesing bit 7 of $4212... we'll be using this command a lot! Like the NES, we're going to learn a better way of doing things later in the lesson! We uise z_hl as our source data, z_bc as the size of the data, and z_de as the destination in VRAM. Our tiles are 16 color 4bpp... so we'd expect our 8x8 tiles to take address entries... but they only take 16! You can see our character drawn to the screen! 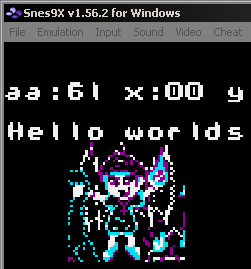 You can create SNES format tiles with Akusprite Editor... in fact AkuSprite editor can make graphics for EVERY SYSTEM IN THE ENTIRE WORLD!!! 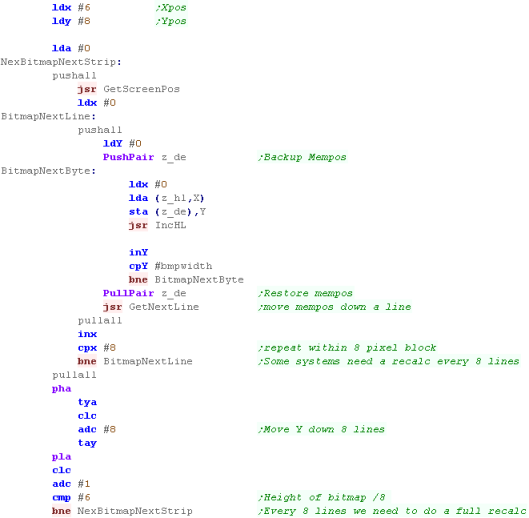 OK, that's a total lie... but it can do every system covered in these tutorials... and that's quite impressive isnt it? BUT... before we can write to these ports we need to be sure we're in VBLANK, so we call WaitVBlank, which will pause untill we are! 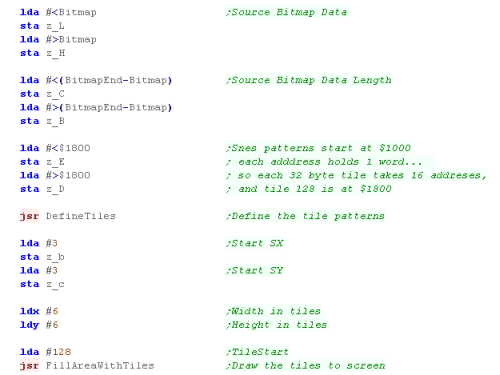 We're now going to set the tiles in the tilemap to show tile patterns we just defined in a grid! We can just keep wriing tiles until we get to the end of the horizontal line, then we recalculate the memory position at the start of the next line. We repeat until the area is filled. 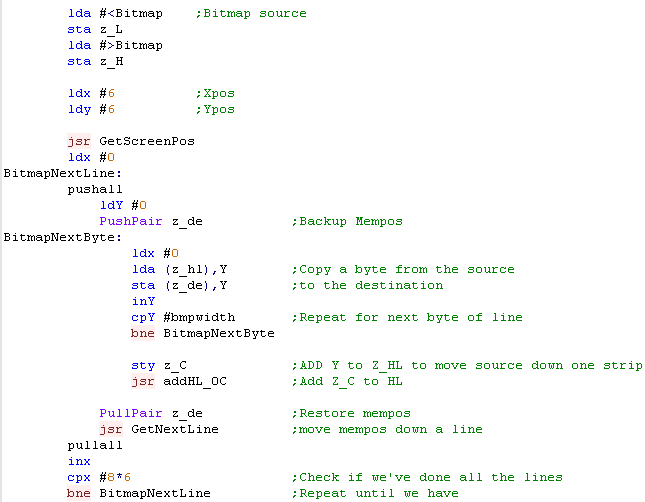 But the SNES makes it easier for us, as we have a DMA which will do a big copy for us during VBLANK! The code above mostly works, but waiting for vblank before each write slows things down (although not much, as the SNES is super fast)... but it also caused noticable glitches in Grime 6502... what we should do is create a buffer of the tilemap, and copy it with a DMA during the interrupt! w 2 $4207 HTIMEL/H Video H IRQ beam pos/pointer 0000000x xxxxxxxx x: Beam position. 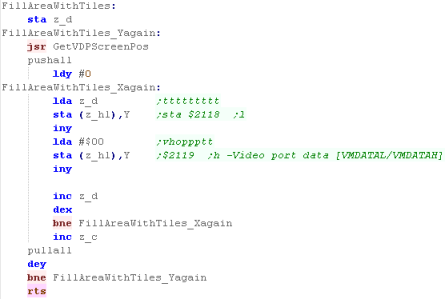 w 2 $4209 VTIMEL/H Video V IRQ beam pos/pointer 0000000y yyyyyyyy y: Beam position. 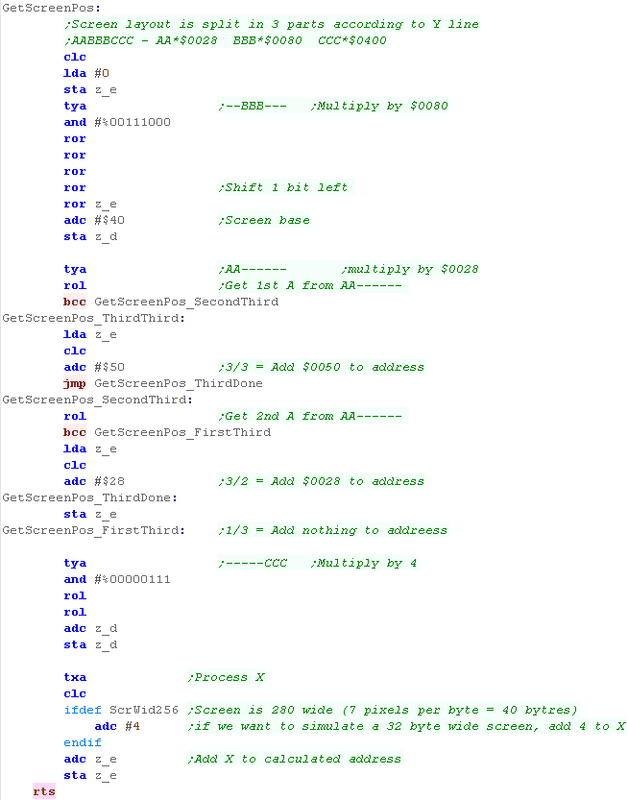 w $420C HDMAEN HDMA enable . 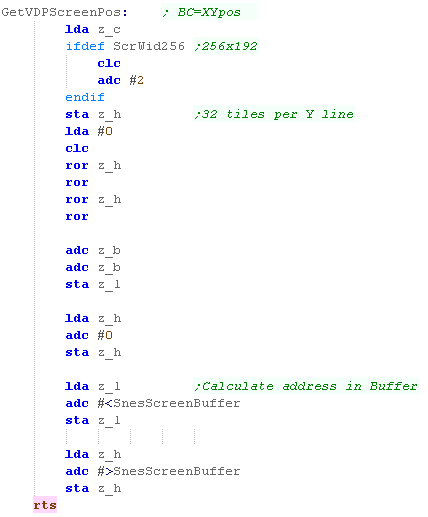 We're going to use a buffer this time... this will be held in ram, and cover the entire 2048 bytes of the tilemap from the ram into the VRAM. Even better, we don't need to do this ourselves! 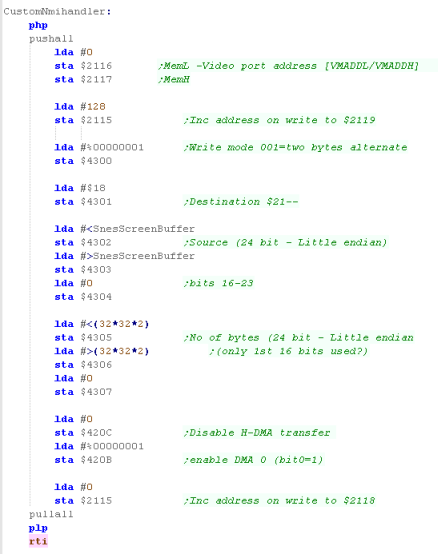 We can use the SNES DMA (Direct Memory Access) to copy the data. 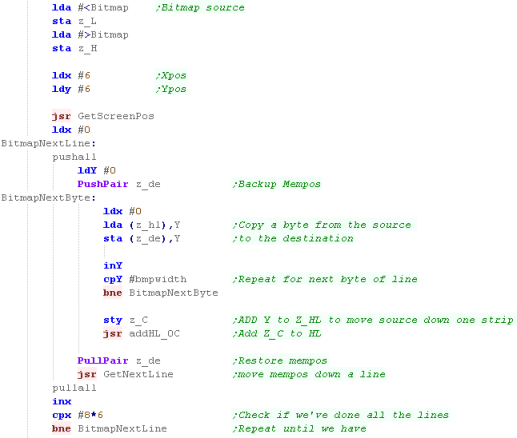 We have to specify the source address as a 24-bit address, because although we're working in 6502 mode, the 65816 is a 24 bit CPU. Having enough RAM and speed to buffer the whole tilemap is a big help... we're still sending the Tile patterns in the same way, waiting for Vblank, but we'll probably only do that a the start of our game/level anyway. So why do we have a Bitmap Functions lesson?... well, we can use custom characters like tiles, and do the job that way!